Hello there, I hope everyone is having a wonderful weekend. I’m actually having a very relaxing weekend. Anyways, I know so many of us crafters tend to buy more and more things because they are “oh so cute” and we think we need to have everything but, in reality most of us don’t have time to use everything. With that being said I have made the decision that I can’t really buy too many new dies or stamps until I use the many that I bought several years ago and never used. Plus, with me staying home with the baby my craft supplies fund have diminished greatly so I kind of have no choice. The cards I’m sharing today are done with some oldies but goodies. Now, for some reason I have an envelope full of vellum strips that I’m not quite sure where they came from. I’m thinking they were used in packaging for some things that I had ordered years ago. Anyways, they are the perfect size to make 3×3 mini note cards so, I did just that. 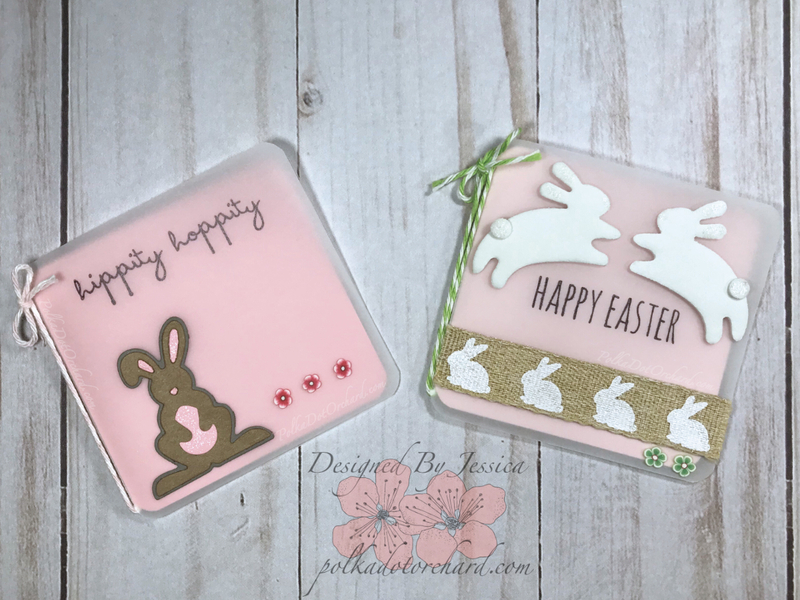 Both bunnies were cut using bunny dies from Quickutz. Since I was using old things from my craft stash I figured it would be fitting to use cardstock for my scrap pile. Which was used to make the brown and pink bunny. To make the white bunnies I actually use some scraps of fun foam. The inside pink layer of the cards was also made using scraps of cardstock. I used my Tim Holtz paper trimmer to cut the pink paper to a 3×6 strip, scoring it in the middle at 3in. After folding it at the score line, I went back to my paper trimmer to trim just a little bit off the top and the side so it would sit in the velum ever so slightly. Using my We R Memory Keepers Corner Chomper I chopped all four corners of both my folded vellum piece and my pink cardstock piece. To hold the inside pink cardstock to the vellum I wrapped some pretty twine around the fold of both cards, tying it off with the cutest little bow ever. When piecing together small die cuts I always turn to my trusty Xyron sticker maker, in which I always use the repositionable sticker adhesive. This is what I used to attach and piece together the bunnies. 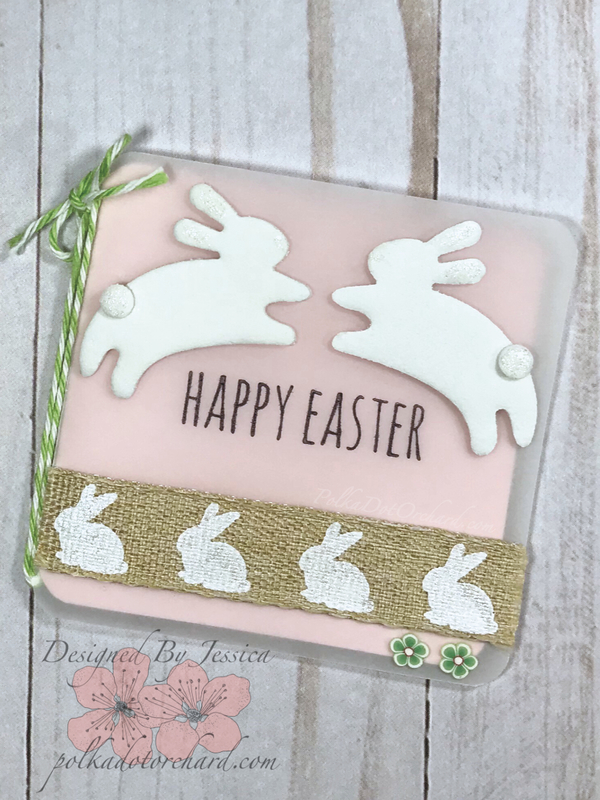 I also use the sticker maker for the nice bunny ribbon. Using some Ranger multi medium matte glue I attached the cute itty bitty flower embellishments to the bottom corner of the cards. One last thing, the sentiments on the card fronts. 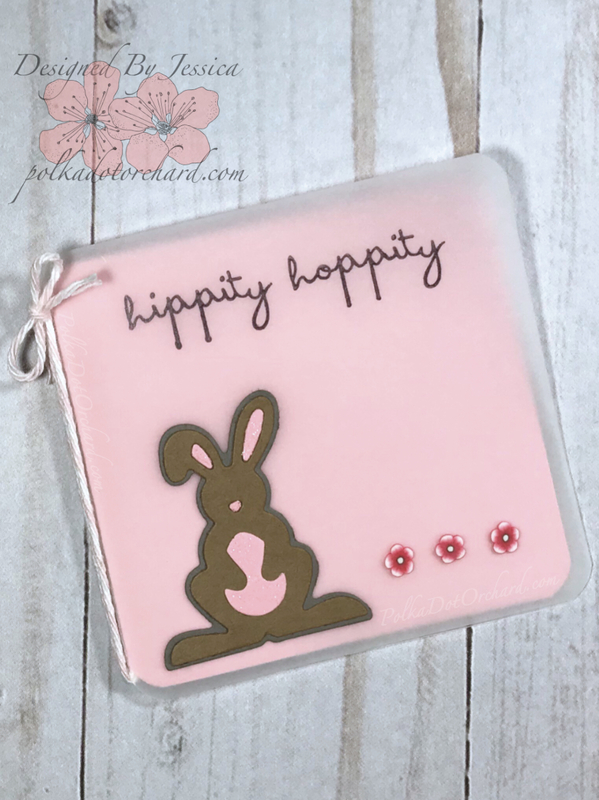 I used my Tim Holtz Stamping Platform and Stazon ink to stamp “hippity hoppity” and “HAPPY EASTER” on the front of my mini Easter cards. The sentiments are from the “Crazy Talk” Tim Holtz stamp set by Stampers Anonymous. That’s it for these cards, I hope I have inspired you to dig through you crafty toys and use some of your oldies.